In this post we will be discussing about Local Functions which was introduced in C# 7. C# 7 Local Functions gives you the ability to declare methods and types in block scope. C# 7 allows you to define local methods and they can be called within a method itself. Just think Local Functions as a normal functions but the scope of the local functions is to the block were they have been declared. In the following code you can see that we have created a Local Function inside the method. Now when we am trying to access it outside that function it throws an error that 'myLocalFunction' does not exist in the current context. 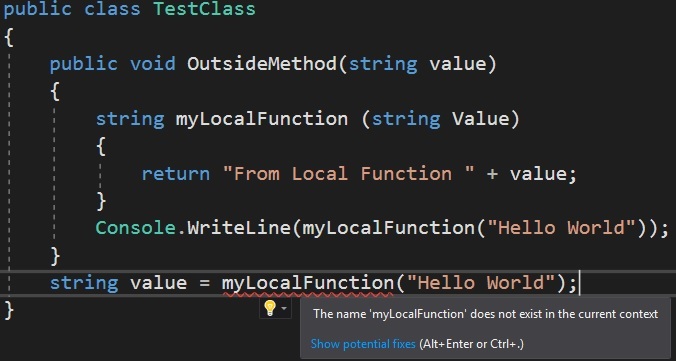 Is Local Functions New to C# Developers ? 1. Local functions can be a Generic Function whereas Func and Action cannot be Generics. 2. Local functions support ref and out parameters which has the same functionality as the function whereas in Func and Action you cannot use ref and out parameters. 3. Local functions can be implemented as an iterator whereas Func and Action cannot be used as an iterator. 4. Local functions looks better and whereas Func and Action could be confusing to read sometimes.